It is crucial for you to choose the right dog food for your pet in order to meet its nutritional needs. You have to consider various aspects such as its age, size, weight, and most importantly breed. Also, you have to keep in mind that even though most commercial dog food brands are formulated with nutrients, not all of them is right for all types and breeds of dogs. Dogs require nutrients in differing quantities throughout their lifetime. The nutritional needs of a small puppy are different from a senior dog. If you are not sure about the differences in the nutritional requirements of puppies and adult dogs, you have to do your research or consult a professional. According to the experts, dogs require thirty-eight different nutrients per day. You have to check the label on the dog food packaging to see if it is balanced and complete. This will tell you if it contains all the nutrients dogs need. It is important for you to choose the right type of dog food for your dog. You can consult the veterinarian for help and advice regarding the most suitable dog food for your pet and there are already a number of excellent guides available online whether you are looking for dog food for a golden retriever or other popular breeds. We suggest checking some of those out if you really want an in depth look into what your breed of dog should be eating but the following guide aims to offer an informative overview of some of the most popular breeds of diets and their dietary needs. This has been designed with multi breed households in mind so if that describes your home please read on. In general, there are four primary types of dog food: kibble, moist, semi-moist, and frozen. Kibble has low moisture content. It is inexpensive and easy to store. It does not expire as quickly as other types of dog food. You can store it in the cupboard. It is easy to serve since there is no cooking or unthawing necessary. It is also crunchy, which helps clean your dog’s teeth as well. However, since kibble is dry, you need to make sure that your dog drinks plenty of water to stay hydrated. Moist dog food is the ones that come in cans. Unlike kibble, moist dog food has moisture content. It is soggy and does not require much chewing, thus making it ideal for senior dogs and dogs with poor dental health. However, moist dog food has to be cooked at high temperatures for sterilization. When you buy moist dog food, check out the water and protein content. More water content means that there are fewer nutrients, so the dog has to eat more. Semi-moist dog food is typically used for dog treats. Dog experts do not recommend using semi-moist dog food on a regular basis due to its low nutrient content and high artificial flavoring content. It is chewy and looks like soft pellets. If you ever choose to feed your pet with semi-moist dog, only do so once in a while. Frozen dog food is typically raw. Raw dog food has to be frozen for sanitary purposes. This kind of dog food is highly recommended by experts due to its high nutrient content. However, it is very expensive, takes a long time to prepare, and it does not have a long shelf life. It is not ideal to keep frozen dog food in the fridge for more than three days. Yorkies are small in size, regardless of their age. Even adult Yorkies look like puppies. This is why they do not need to eat a lot of food. Unlike the other breeds of dogs, they are not able to eat two meals per day. They typically weigh between three and eight pounds, and only need 150 to 200 calories per day. If your dog is not that active, you may give it 150 calories per day. If it is bigger and a little more active, you may give it 200 calories. It is crucial for you to search for the best dog food for yorkies in order to give your dog all the nutrients its small body needs. You have to be careful with how much food you give your pet. Since these tiny yorkies cannot eat more than one meal per day, you should try splitting this meal into tinier meals. You can split one meal into four smaller meals, for instance. Keep in mind that small dogs can get sick if they overeat. The best dog food for yorkie puppies contains protein, carbohydrates, and fats. Ideal protein sources include chicken, beef, turkey, lamb, and fish. Most commercial dog foods contain these meats as primary ingredients, so you would not have any problems in this area. Just make sure to avoid proteins that do not come from animal muscle. Read the labels of dog food packages and make sure that they contain real meats instead of animal by-products or processed ingredients. Carbohydrates are also necessary. However, since your dog is small, you have to be extra careful with its carbohydrate intake. Take note that some types of carbohydrates can be harsh on the stomach of dogs. Soy and corn are examples of these carbohydrates, and some dog foods contain them. You need to avoid buying dog food that contain these types of carbohydrates. Instead, you should look for healthier sources of carbohydrates such as rice and sweet potatoes. As much as possible, you should choose brown rice. Just make sure that it is good in quality. Cheap brown rice may contain arsenic, which is not good for your dog. Furthermore, you should go for dog foods that contain adequate amounts of fat. Yorkies need to consume fat to keep their coats long and shiny. Ideally, you should give your dog some fish oil. If you cannot find a dog food that contains fish oil, you can purchase fish oil separately and drizzle it all over your dog’s food. If you are still unsure of what dog food to buy, you can consider the following brands of dog food. Experts chose these dog foods based on their nutrition content, taste, and quality of ingredients. They are safe for Yorkies at different stages of life. Of course, you should give your dog the food that is appropriate for its age. Puppies need puppy food while adult dogs need adult dog food and senior dogs need senior dog food. This dog food comes in the form of kibble to encourage chewing. It is especially formulated to suit the needs of Yorkies over ten months of age. Its formula promotes softness and continuous growth of hair. So, if you want to maintain the shiny coat of your pet, you should feed it with this dog food. It contains omega-3 and omega-6 fatty acids, as well as biotin. It is also highly palatable, perfect for Yorkies that have fussy appetites. The wonderful blend of flavors and aromas will surely delight your pet. In addition, this dog food is ideal for senior dogs. It can help them maintain good health as they age. This dog food comes in kibble shapes that are easy to chew and grasp. In fact, it is especially designed to fit small Yorkie jaws and encourage them to chew. It is recommended for Yorkie puppies up to ten months of age. It has a formulation that satisfies the fussy appetite of puppies and supports their growth. It promotes shinier coat and healthier skin, thanks to the biotin, omega-3 fatty acids, and omega-6 fatty acids that it contains. It also promotes a healthier digestive system. Good digestive health is vital during the growth period of puppies because their digestive systems still cannot absorb nutrients as efficiently as those of adult dogs. This dog food is specifically created to fit the needs of adult Yorkies. It contains high quality proteins and a fiber blend of prebiotic FOS and natural beet pulp to promote better digestion and nutrient absorption. It also contains copper, zinc, and omega fatty acids that make the coat and skin healthier. Dogs are also surely going to love the taste of real chicken. With every bite, your dog is going to be much healthier. Dog experts and other dog owners recommend this dog food for its taste, quality of ingredients, and nutritional value. This dog food is especially formulated to cater to the needs of small breed puppies. It comes in the form of kibble for easy biting and chewing. The small size of the food is perfect for the small jaws of these Yorkie dogs. It contains a special formulation that supports brain development as well as promotes overall health. It also promotes strong immune system and healthy heart. It is made with the finest ingredients to provide balanced and complete nutrition for nursing dogs, pregnant dogs, and puppies. It helps increase energy levels to keep your puppy active throughout the day. This dog food contains complex antioxidants and nutrients to help small breed dogs maintain their vitality and deal with the signs of aging better. It has a special formula that makes it easy to eat and digest. It is very palatable and satisfying. Even dogs with a fussy appetite are surely going to love and get hooked onto it. It contains proteins and fibers to ease and regulate intestinal transit. It comes in the form of kibble so that small dogs can easily bite and chew it. It also helps reduce their chances of building up tartar. It is recommended by experts to extra-small breed dogs from eight to twelve years of age. Pitbulls are large dogs. In spite of their size, they still make excellent companions. They are obedient and intelligent. They are also playful, which is why they need to have lots of energy to remain active. Selecting the ideal dog food for your pitbull requires adequate knowledge and understanding of the nutritional demands of dogs that belong to this breed. You also have to take note of the possibile health issues that they may develop. Pitbulls generally have a muscular body and stock appearance. Small female pitbulls can weigh around thirty pounds while large male pitbulls can weigh around seventy pounds. Aside from the weight of your dog, you should also consider its metabolism and activity levels. To prevent obesity, you should create a feeding schedule for your dog. You must only feed it during these times of the day. Make sure that you also measure the amount of food that it consumes. Pitbulls typically need 922 to 1740 calories, although puppies and pregnant dogs need to consume more calories. Since pitbulls have a muscular built, they need proteins and fats in their diet. However, they also need carbohydrates. The key to providing your dog with the best nutrition is finding the right balance between protein, fat, and carbohydrates. Your dog may need to consume forty to fifty percent protein in its diet if it is active. Make sure that the food you give it contains two to three meat meals or whole meat that comes from chicken, turkey, beef, fish, or lamb. Your dog also needs fat to retain its energy levels. Fat improves the taste of food and maintains temperature to help dogs have shiny coats. Most large breed dogs need to consume ten to twelve perfect fat, but pitbulls should consume fifteen to twenty-five percent. When it comes to carbohydrates, you have to keep it low to moderate. Puppies need to consume twenty-five to thirty percent of carbohydrates. Make sure that your dog does not consume more carbohydrates than it should. Otherwise, it can have loose stools and diarrhea. Your dog also needs vitamins and minerals that can come from vegetables and fruits. These nutrients promote overall health and improve the immune system. Dogs need calcium, iron, sodium, and phosphorus for the production of hemoglobin. Your dog should consume enough calcium to prevent any skeletal abnormality. The following are some of the best food for pitbulls available commercially today. This dog food contains lean red meat bison as its primary ingredient and source of protein. It helps dogs develop lean muscle mass and sustain their energy levels. It contains lamb meal and bison meal, which are rich in amino acids. It also contains egg protein. This dog food is grain-free, balanced, and complete. It is protein-focused, containing premium sources of protein such as chicken and turkey. It also contains vegetables, as well as vitamins and minerals. It does not have any wheat, soy, corn, meat by-products, artificial colors, preservatives, and flavors. This dog food has a grain-free formula that provides digestible energy for dogs. It contains peas, sweet potatoes, real roasted meat, fruits, and vegetables. It tastes great and ensures that your dog gets the nutrients it needs to stay active throughout the day. This dog food has a complete and balanced formula that would satisfy your dog’s craving for wet food as well as keep it strong and healthy. It contains smoked salmon and fresh salmon, which are great sources of omega-3 fatty acids. It also contains raspberries, sweet potatoes, and blueberries, which are excellent sources of antioxidants. This dog food is grain-free and contains real duck as its primary ingredient and source of protein. It comes in the form of kibble and is mixed with pieces of vegetables and fruits. It has natural fibers that promote digestion. It also has fatty acids and antioxidants. It does not have any corn, soy, or wheat. Every ingredient has been carefully selected to ensure that dogs only get the best. There are few things in this world that are better than a dog’s loyalty and love. Humans repay this by becoming dogs’ best friends. That’s why true log lovers see to it that they provide their pets with only the best. Proper nutrition, adequate exercise, a comfortable dog home are just some of the things humans provide to make sure their pets are truly living the ‘best friend’ life. Dog owners want to make sure that their pets live a long life. One of the many ways they can do this is by providing a healthy diet for these dogs. This article aims to break down and analyze the dietary needs of Huskies, Pomeranians and Huskies. It also includes a review of the best dog food for each breed. The Siberian Husky is a medium-sized breed originating from Siberia and Russia. It comes from the Spitz family. It’s a very active and energetic breed. It has historically been used as hunting dogs by hunter-gatherers from Russia. What set Siberian Huskies apart from other breeds are their eating habits. Huskies are known to regulate their food intake when they are inactive. These dogs eat less or do not eat all when they do not have exercise. Huskies must also maintain healthy weight. A male husky typically weighs up to 60 pounds while female huskies can weight up to 50 pounds. An average adult husky need around 1100 calories a day. Meanwhile, those with more active lifestyles need 18000 calories. Older huskies need around 1000 calories per day. Overweight huskies are more prone to sickness. They also have a shorter life span than the healthy ones. Of course, it is also not good if the husky is underweight. It is therefore essential to feed them regularly with good food. Ideally, huskies should be fed two to three small portions a day. As mentioned earlier, they typically do not eat when they do not get much activity. Most huskies will only eat after they have had exercise. It is therefore recommended to take a husky for a walk at least three to four times a week. Huskies are also pretty possessive and territorial. If there are two or more dogs in the household, it is better to each give them a canine eater. Experts recommend that huskies’ meals be composed of at least 40% to 50% of protein. As for fats, it is recommended to feed them at least 20% to 25%. Huskies do not need carbohydrates that much. Look for a brand that has pea, potato or sweet potato in it for fiber. Aside from the aforementioned, look for a brand that has a lot of vitamins and minerals. Vitamin A is key for healthy skin and shiny coat. It also helps maintain eyesight. Huskies are prone to eye problems hence they need a lot of Vitamin A. Aside from that, calcium is also needed for strong bones and teeth. Meanwhile, vitamin B9 fights anemia. Huskies also need fatty acids like Omega 3 and Omega 6. Avoid dog food that contains artificial colors, flavors, and preservatives. Dog food with animal by-products should also be avoided. These substances may pose threats to a dog’s health. What Huskies need the most is Zinc. Huskies are prone to zinc responsive dermatosis. This disease is commonly associated with lesions located in the mouth, eyes, scrotum and other sensitive areas of the skin. As its name suggests, this disease is due to lack of zinc. Aside from skin lesions, it can also cause problems to metabolism and sexual function. It also interferes with wound healing. Dogs with zinc responsive dermatosis also do not have protection against infections. Good amounts of protein and zinc are always found in the best dog food. The following are some of the best dog food for Huskies. Huskies get the wonderful taste of the wild with Taste of the Wild Canine Formula. The nice thing about this dog food is that it is made from real smoked salmon and sweet potatoes. It is a grain-free formula making it good for dogs with sensitive digestive systems. It contains vitamins, minerals and antioxidants to help improve the dog’s health. One cup of the Taste of the Wild Canine Formula contains 360 kilocalories. Aside from sweet potatoes and salmon, it also contains peas, canola oil, dried chicory root, blueberries, and tomatoes. Dogs will surely love it because it is available in several flavors namely boar, bison and venison, salmon, lamb, wildfowl and venison. Taste of the Wild Canine Formula deserves 8.4 stars out of 10. Blue Buffalo brand has a very unique food mix called the Life Protection formula. This formula contains LifeSource Bits further enhanced with seven antioxidant ingredients namely blackberries, apples, cranberries, blueberries, pomegranate, spinach and pumpkin. It also contains deboned lamb, turkey meal, whole grains and other vegetables and fruits. This mix will provide huskies with all the proper nutrients he needs. Owners need not worry because it does not contain any traces of chicken nor poultry by-product meal. It also does not contain any wheat, soy, corn or any other artificial flavors, colors and preservatives that might be harmful to dogs. The pieces are triangular and just about the size of a pea. Huskies will not have a hard time eating it. It is available in several flavors that dogs will surely love. We rate Blue Buffalo Life Protection Dry Adult Dog Food 8.3 stars out of 10. The Wellness CORE Natural Grain Free Dry Dog Food has three main good points. It is a protein based, grain-free and antioxidant rich formula. This dog food is made up of 80% more meat as compared to other dog food brands. It does not contain any traces of grain and other animal by-products. Dogs are kept healthy because it contains essential vitamins and minerals like Omega 3 and Omega 6. The Wellness CORE Natural Dog food aims to improve the dog’s eyes, teeth and gums, skin and coat, digestive health, immune system and energy levels. Dogs will love the different flavors of this dog food. It is available in ocean whitefish, herring and salmon, original turkey and chicken, and wild game duck, turkey, boar and rabbit. We rate Wellness Core Natural Grain Free Dry Dog Food eight and a half stars (8.5) out of ten. Huskies are a very active breed. They need a lot of energy every day. Nutro Max provides exactly just that. Nutro Max truly delivers the maximum amount of vitamins, nutrients and protein without the empty calories. This mix is made from chicken meal, brewers’ rice, whole grain sorghum, chicken, peas, flaxseed, whole brown rice, chickpeas and vitamins and minerals like potassium chloride, Pyridoxine Hydrocholoride (Vitamin B6), Vitamin B12 supplement, Folic Acid, Vitamin D3 and many more. Dog owners can be sure that it is safe for their huskies because it does not contain any chicken by-product, wheat, corn, or soy protein. We give eight stars out of ten to Nutro Max Dry Dog Food. What sets Origen apart from the other dog food is that it is made to match the anatomy of dogs. It has higher protein contain because it is made from fresh meat. It also contains no traces of cereals and fewer carbohydrate-content. It also contains more fruits, vegetables, herbs and probiotic bacteria good for the dog’s health. Origen sees to it that it only uses fresh ingredients. It does not use any dried or frozen ingredients, most of which come from Canada. Freezing and drying food lessens the nutritional value of food. Furthermore, it helps dog have shiny coats, healthy skin and good eyesight because it contains vitamins and minerals like vitamin B3, omega 3 fatty acids, lutein, protein and zeaxanthin. We give nine stars out of 10 to Orijen Adult dog food. Pomeranians are undeniably one of the cutest dogs. Fondly known as Pompom, Pom and Tumbleweed, Pomeranians belong to the German Spitz family. This breed is named after the Pomerania region of Poland and Germany in Central Europe. It was popularized by the British royal family particularly by Queen Victoria. Despite being small, Pomeranians are bundles of joy. This foxy-faced dog is by nature cocky, animated, spirited and bold. They lose weight easily when fed insufficiently. Poor diet also causes digestive system problems like malabsorption and diarrhea. Look for food that will provide enough calories. A Pomeranian needs around 300 to 400 calories every day. Pomeranians have small jaws. Smaller kibbles would be easier to chew and digest. Dogs are by nature carnivores. Because of their active nature, Pomeranians need a lot of energy from protein. Experts recommend that dogs must at least have 40% protein in their diet. Find dog food that have real meat ingredients. Best dog food for Pomeranians usually use lean meat such as white chicken breast and fish. Some also use organs from animals such as kidneys, livers and brains. They also include fruits and vegetables to provide fiber. Also check the food if it has vitamins and minerals. Pomeranians are known for their beautiful double coat. However, they are prone to skin allergies and joint pains. Omega fatty acids and other fish oils will help prevent and treat skin allergies. On the other hand, chondroitin and glucosamine will help in strengthening joints. Avoid food that use artificial colors, flavors and preservatives. These substances may pose threats to the dog’s health. Also avoid food that have soy, wheat, corn and animal by-products. These may cause allergic reactions. Lastly, do not give food that may contain any traces of caffeine, chocolates, coffee, onions, garlic, raisins, macadamia nuts, grapes, bones and spicy foods. As mentioned, Pomeranians lose weight easily. Their active lifestyle causes them to burn calories faster than other dog breeds. A growing Pomeranian needs to be fed at least three to four times a day. While an adult one can be fed at least two times a day. It is advised to appropriately space the meals. Avoid feeding them before bedtime. Despite their small frames, Pomeranians are energy bunnies. They need a lot of protein to replenish their energy. The Blue Wilderness series is perfect for Pomeranians because it is high in protein. One cup of this dog food is around 400 kilocalories. Dog owners also need not worry about grain allergy because this dog food is grain free. It is made from chicken meal, deboned salmon, carrots, peas, menhaden fish meal (an excellent source of Omega 3), dried tomato, chicken fat, dried egg and flaxseed. It also contains essential vitamins and nutrients like Ferrous Sulfate, Calcium Carbonate, Vitamin E Supplement, Taurine, Manganese Sulfate and many more. Because of this, we rate Wilderness Blue Buffalo High Protein Dry Adult Dog Food nine and a half (9.5) stars out of ten (10). Wellness CORE Natural Grain Free Dry Dog Food contains 80% more protein than other dog food brands. Aside from that, it also has live active prebiotics, probiotics and fiber which helps dogs keep a healthy digestive system. It also contains essential nutrients for healthy teeth and strong gums. It also has fatty acids like omega 6 and omega 3 for shiny coats, healthy skin and strong immune system. Other than the aforementioned ingredients, it also contains chicken meal, peas, deboned turkey, chicken liver, apples, parsley, blueberries, broccoli, kale, sweet potatoes, carrots, salmon oil and flaxseed. Pomeranians will enjoy the various flavors of this dog food. Some of its flavors are original turkey and chicken, ocean whitefish, herring and salmon, and wild game duck, turkey, boar and rabbit. 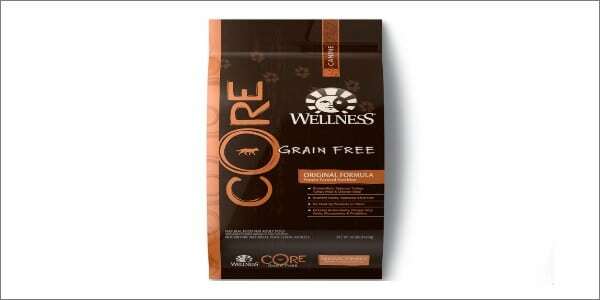 We give Wellness Core Natural Grain Free Dry Dog Food nine (9) stars out of ten (10). Wysong Dog Food, named after its maker Dr. Wysong, is patterned after the archetypal canine diet. It is made to meet the carnivorous nature of dogs. It is made from quality ingredients. It is made from venison meal and various fruits and vegetables like chia seeds, dried kelp, dried plain beet pulp, carrots, parsley, carrots, watercress, lettuce and spinach. Dog owners can also be rest assured that their Pomeranians get the most nutrients because this dog food contains zinc proteinate, ferrous sulfate, zinc sulfate, copper proteinate, copper sulfate, manganese sulfate, vitamin C, vitamin E, supplement, riboflavin supplement, biotin and folic acid. We give Wysong Dog Food eight and a half (8.5) stars out of ten (10). The Freedom Series of Blue Buffalo is one of the most popular brands for Pomeranians. It is all-natural. Dog owners need not worry for potential allergic reactions because it does not contain any traces of grain or glutens. It is made from premium natural ingredients like beef, chicken, lamb and fruits and vegetables like blueberries, kelp, carrots and sweet potatoes. Most Pomeranian owners note that their dogs love the flavor of this brand. Blue Buffalo’s small kibbles are also perfect for the small jaws of Pomeranians. We give Blue Buffalo Freedom Small Breed 8.8 stars out of ten (10). Solid Gold is known as America’s first holistic pet food. This dry dog food contains high levels of protein and 20 superfoods. Among the said superfoods are pumpkin, cranberry, broccoli, blueberries, apples and carrots. Pomeranians will also have no trouble eating this brand because it is packaged as small kibbles. Some dog owners even note that toothless puppies were able to eat this with no problem. Dogs will also have no problem with its flavor because it is available in turkey, salmon, lamb, duck, chicken, beef, lamb and fish flavor. We give Solid Gold Dry Dog Food nine (9) out of ten (10). Like Pomeranians, Chihuahuas are also considered as toy breeds. They are the smallest dog breed known to men. They fit inside small carriers and even purse bags, which is why they make the best ‘apartment dogs’. Most dog owners think that food for their Labradors can also be fed to Chihuahuas. However, considering their size, they need different nutritional requirements. Labradors and other bigger breeds eat bigger portions, while Chihuahuas need bite-sized food packed with a lot of energy. Despite being the smallest breed, they need a lot of energy. Other toy breeds like Yorkies only need 150 calories per day. On the other hand, Chihuahuas need around 40 calories per a pound of their weight. The average Chihuahua weighs around 10 pounds which means it would need around 400 calories per day. This is similar to the calorie intake needed by puppies of larger breeds. Like most dogs, Chihuahuas need a diet with high protein. Ideally, their diet must consist of 30% protein, 20-30% fat, and 10% fiber. Lean meats like fish, venison, bison and chicken are good sources of protein. Organs like kidney, liver and brains are good as well. Chihuahuas are prone to hypoglycemia. Complex carbohydrates are a good addition too. Complex carbohydrates can be found in sweet potatoes and brown rice. Chihuahuas are finicky eaters. Look for a flavorful dog brand. If in case the dog keeps rejecting the food, mix the food with something they like. Do not condone their eating behavior by consistently serving bad food. Chihuahuas are prone to a certain number of diseases like diabetes, obesity and dental problems. These diseases can often be prevented through dietary solutions. As earlier mentioned, feed complex carbohydrates to prevent hypoglycemia. For obesity control, make sure that the food is full of protein and complex carbohydrates. Avoid dog food formulas full of ‘empty calories’. To prevent dental problems, it would be wise to give dogs dry food instead of wet food. 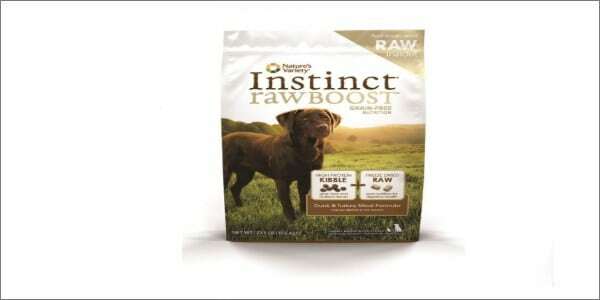 Instinct Raw Boost is a high-protein, grain-free and all-natural dog feed formula. Each kibble is packed with protein, antoxidants, fatty acids and probiotics for the dog’s healthier skin, coat and immune system. Like Pomeranians, Chihuahuas have small jaws. Therefore, it is also important that their dog food are also bite-sized pieces. Instinct Raw Boost provides just that. The kibbles of this brand are small enough for Chihuahuas to enjoy. The instinct raw boost small breed series only has two flavors namely duck and chicken. It also does not contain any potato, corn, soy, grain, by-product meal or any artificial colors, flavors and preservatives. We give Instinct Raw Boost nine (9) stars out of ten (10). Purina is one of the most popular pet food brands in the world. It has been known to deliver quality pet food at a reasonable price. Purina Pro Plan Dry Dog Food is formulated to promote optimal dog health. Specifically, it has been proven to strengthen the bones and teeth, improve the skin and coat, fortify the heart, and support healthy joints. Like the aforementioned brands, the kibbles of this brand are also optimized to suit a Chihuahua’s small jaw. It contains chicken, wheat, maize, dried beet pulp, dried chicory root, soya meal and fish oil. In closer analysis, it was found that 27% of it is protein, 17% fat, 7.5% crude ash and 2.0% crude fibers. We give Purina Pro Plan Dry Dog Food eight (8) out of ten (10) stars. As its name suggests, the Orijen Dry Dog Food is grain-free. It is mainly made up of deboned chicken and deboned turkey meal. The ingredients are all farmed fresh and free of preservatives. The chickens and turkeys used in making this product were free-run. Each piece of the Orijen Grain-Free Dry Dog Food is packed with 85% premium animal protein and 15% fruits and vegetables. Specifically, it contains fruits and vegetables like licorice root, angelica root and fenugreek, butternet squash, cranberries and blueberries. One cup of this dog food contains 449 kilocalories. For small dogs like Chihuahuas, it is advisable to give at least one to two cups per day. This dog food is excellent in every single way so we give it a perfect score (10 out of 10 stars). It is common knowledge that toy breeds like Chihuahuas need a lot of energy despite of their small frames. These dogs commonly move around a lot. They also need kibbles that can be munched using their small jaws. Wellness Complete Health Toy Breed Dog Food provides just that. It is specifically designed to meet the needs of toy breeds like Chihuahuas. The kibbles are small enough for the dog to enjoy while still maintain a crunchy texture for oral health. It also contains nutrients like Omega 3 and Omega 6 fatty acids for healthy skin and shiny coat. It also has glucosamine hydrochloride and chondroitin sulfate for healthy joints. It is safe for dogs with corn, wheat and soy allergies. We give this brand a nine (9) out of ten (10) stars. As its name states, this dog brand uses chicken, brown rice and sweet potato. But aside from that, it also has fruits and vegetables like barley, lamb meal, plain beet pulp, split peas, carrots, flaxseed and many more. The brand boasts of all-natural and non-GMO ingredients. Furthermore, it does not have any artificial flavors, colors or preservatives. It has essential vitamins and minerals like vitamin E for a stronger immune system, and omega 3 and omega 6 for healthier skin and shinier coat. Owners have been noting how their dogs refuse to eat other dog food after getting a taste of this one. We rate Nutro Wholesome Essentials Dry Dog food a nine and half (9.5) stars out of ten (10).